American violinist, conductor, and music educator Anshel Brusilow passed away earlier this week. He was 89. Born in Philadelphia in 1928, Brusilow entered the Curtis Institute of Music at the age of eleven, where he studied with Efrem Zimbalist. Between 1954 to 1955 he was concertmaster and assistant conductor of the New Orleans Symphony. In 1955 he moved on to become assistant concertmaster of the Cleveland Orchestra under George Szell. Four years later, Eugene Ormandy tapped him for the position of concertmaster of the Philadelphia Orchestra. While in Philadelphia, Brusilow became increasingly interested in conducting, founding the Philadelphia Chamber Orchestra. In 1970, he was appointed executive director and conductor of the Dallas Symphony. 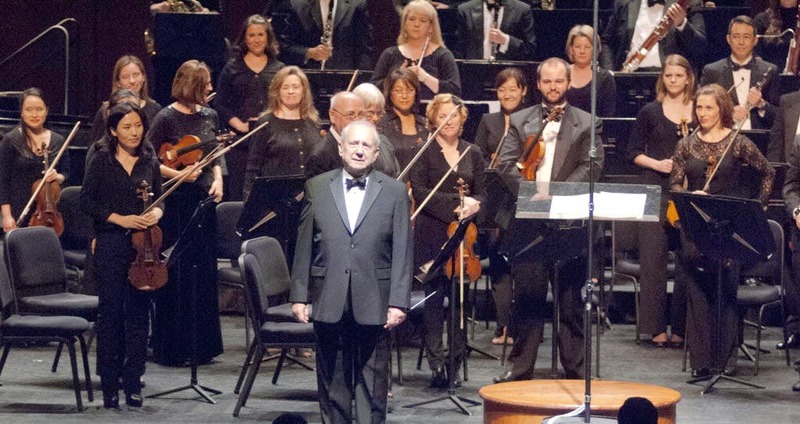 His final years were spent as music director of the Richardson (Texas) Symphony and as Director of Orchestral Studies at the University of North Texas College of Music. His rich and varied life is chronicled in the 2015 autobiography, Shoot the Conductor: Too Close to Monteux, Szell, and Ormandy. Anshel Brusilow’s concertmaster solos can be heard on some of the Philadelphia Orchestra’s most celebrated classic recordings. The shimmering, “old school” romanticism of his playing is a highlight of this 1960 Philadelphia Orchestra performance of Richard Strauss’ Ein Heldenleben with Eugene Ormandy. Throughout the tone poem, Strauss uses the violin to depict the spirit of his wife. It was like a dream come true. As a child growing up in Philadelphia, I had fantasized about leading the orchestra, to the point that I would sit at home and play along with recordings. I already knew most of the players, but even so, I was amazed by the different atmosphere in rehearsals. On the morning of my first day as concertmaster, I was so busy chatting with the other players that I hadn’t even noticed Ormandy arrive until I felt his welcoming hand on my shoulder. That was part of Ormandy’s secret. By encouraging a friendly working atmosphere, he obtained a warm, opulent sound that was the complete opposite of Szell’s. Ormandy was also incredibly supportive, so whenever we played anything with an important solo violin part, such as Scheherazade or Ein Heldenleben, he left me free to develop my own vision and would follow me, which was a fantastic feeling. Thank you, Timothy Judd, for this informative and warm remembrance of violinist Anshel Brusilow, one of the greats of his time. The recorded legacies of today’s orchestras may face problematic futures, but recordings of the Big Five orchestras in the latter half of the Twentieth Century seem secure into the future. Brusilow was an artist of the first rank in what we now see as a Golden Era.